I've been making truffles, as I mentioned in my triple bean truffle post. By the way, the answer to what three beans were used in the triple bean truffle is coffee bean, cocao bean and black beans!...... (but I don't tell anyone about the black beans as it puts them off)! 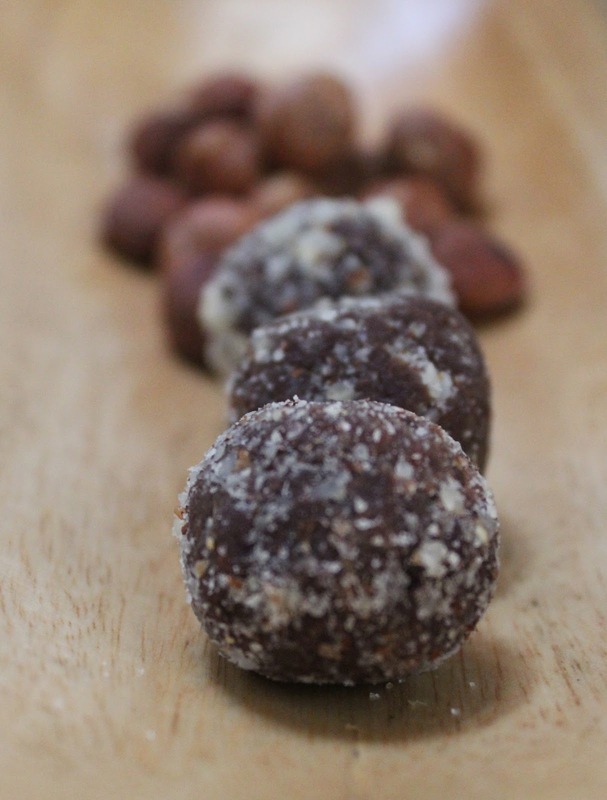 This time, I was thinking about Ferrero Rocher chocolates and decided to make a hazelnut truffle without dairy, refined sugar or gluten/wheat. The truffles were (yes, they are no longer!) basically a whole hazelnut surrounded by a creamy delight (ground hazelnuts, coconut milk, raw cocao powder) and the rolled in more ground hazelnuts. I found them to be very satisfying - which is why they weren't around for long. I omitted the crispy crunchy outer layer that a Ferrero Rocher has but otherwise, they were pretty similar. A good occasional treat that hit the spot!